Rena Ryuuguu: A shy, sweet girl with an obsession for cute things. Aggressive when provoked enough. Mion Sonozaki: An aggressive girl and leader of the club the main characters join. Her family has a very strong influence in the town. Shion Sonozaki: Mion's twin sister. Has spent most of her life in boarding school in another town. 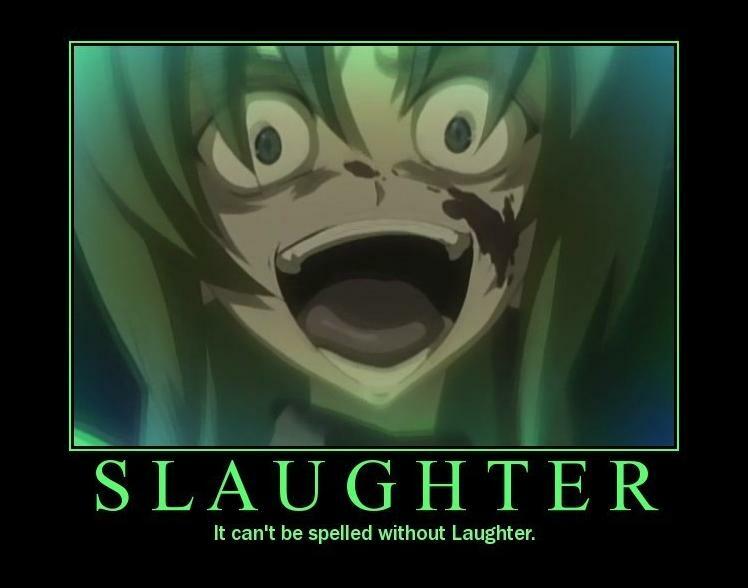 Satoko Hojo: Self proclaimed "master of traps". A mischievous girl who tries to forget her problems at home. Rika Furude: A young girl who is made a shrine maiden after her parents died. Mature for her age. From what you might expect from the poster at the top of the article, this series is not for the faint of heart. There actually aren't a whole lot of gory scenes but the ones that are are quite disturbing, to say the least. I won't go into details here but there were a few times where I would grit my teeth and think to myself “Boy am I glad I'm on the other side of the screen!” Where do these schoolgirls learn how to torture one another anyway? Maybe Japan has different children's programing? The series is a little hard to follow with the constant restarting. There are 3 different time lines that are presented and each arc keeps switching between them. Usually within the first few minutes you can figure out if it is a new time line or an old one. Whenever a time line is revisited new information is revealed about the characters, the town, and the festival. What you assumed had happened the first time around might be reveled to be completely different. Enemies become friends, and friends become enemies. In Hinamizawa, nothing is what it seems. Overall, I would at least recommend watching the first and second arc and see if this series appeals to you. If you don't really care what happens by the end of the second arc, nothing that happens afterward is going to justify watching the rest of the series. However, if you find yourself dying to know what's really happening in Hinamizawa, When the Cicadas Cry is an interesting series that will keep you entertained until the very end. Thank you for coming into the Hinamizawa Adoption Agency, Liz. All of our little darlings are looking for loving families to take them in. Susie over there is very bright and already reading at a level well above average. Laura loves music and was always singing or whistling before her front baby teeth fell out, just look at that cute smile. And over there is Sarah who just murdered her first victim this week! This victim was found with the knife still in the side of her throat, but little Sarah has recently been playing with a razor blade and some rat poison, so we expect a lot of versatility out of our precious killer. Now tell me Liz, do any of these young sweethearts tug at your heartstrings enough for you to bring them into your home? I'm sorry! I can't really make a decision until I find out what adorable noise they make at the end of each sentence. If they don't make a signature noise, I'm not interested.